In 1922, Robert Flaherty premiered one of the world’s first documentaries, Nanook of the North. It took him two years and five expeditions across the expanse of frozen Canada to capture the “reality” of life in the Arctic. These days, it’s quite a bit easier, as you can hop on a plane in London and arrive in Ivalo, Finland in about 4 hours, your camera equipment safe and sound in the overhead. But it’s still the Arctic. And it’s still cold. Here are three tips by Lapland professionals on how you (and your equipment) can survive when filming in the cold. Winter in Lapland lasts anywhere from five to eight months, depending on weather conditions and location. But no matter where you are, it rarely rises above freezing from December to March. Clothing may be optional in the sauna, but not when you’re hiking up the side of Halti fell in Kilpisjärvi. According to Jussi Pietikäinen of Harriniva Hotels & Safaris, the trick is layers. The Film Friendly company has decades of experience guiding visitors through the Arctic. “The easiest way to stay warm is with different layers. The colder it is, the more layers I wear. It is also important to have a very warm hat and something to protect your neck from the cold air. You lose most of your body heat through your head. “When travelling by foot or skis you don’t need so many layers, because you generate so much body heat from the movement, but if you stop you should have an extra warm jacket to put on. When I travel on snowmobile, I try to wear a windbreaker for my outer layer. Also, I try to cover my face with a balaclava as well as possible, so the wind factor won’t freeze my face. Beyond the basics, you can always turn to the professionals for help. Check out this video by Lapland’s own Flatlight Creative House. 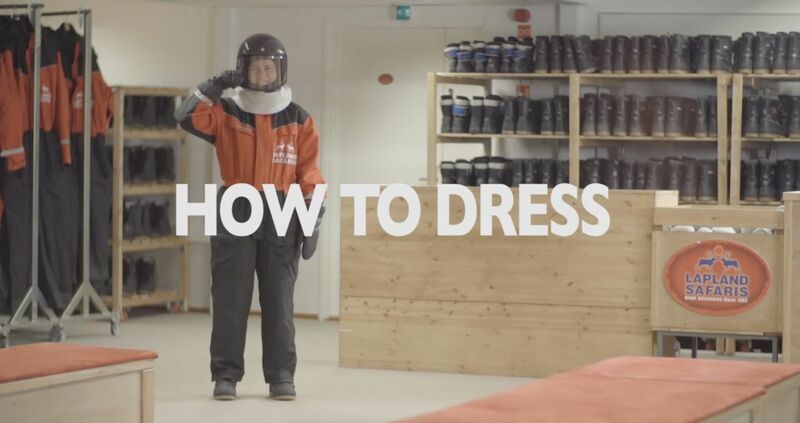 Film Friendly Lapland Safaris has plenty of gear to keep you warm, whether it’s just gloves and boots to fight off the cold and snow, to full jumpsuits for snowmobile expeditions to the shooting locations. With offices and affiliates across northern Finland, Lapland Safaris is happy to lend a hand, or a glove, or a pair of ski goggles if you need it. When the temperature drops, the world gets slippery, and a million YouTube videos are born. But Finnish Lapland has a modern and maintained infrastructure, and that includes the roads, streets and highways. All winter long, from the first snowflake to the last, snow plows and snow gritters keep the roads clear and drivable. Wear a seatbelt, even in the backseat. Ice on the roads is a real possibility, but what about when the locks on your car doors freeze? Not to worry. You can purchase de-icer to free up your lock, and use the mechanical key on your fob to get inside. But you still have millimeters of ice covering every window surface. Don’t become an Internet viral video by throwing boiling water on your windshield. More likely than not, you’ll be paying for a new windshield. Instead, grab your ice scraper and apply elbow grease. Scraping takes a little time, but it won’t damage your windshield. Don’t forget to gently free your wipers and scrape the ice off those as well. If there’s snow, you’ll probably spend a few minutes brushing your car. Plan for it. As semi-wild reindeer make their way back to their home pastures during the autumn migration, it’s pretty common to see them foraging on the side of the road. Be warned: Lapland is reindeer country, and they often will ignore you or walk on the road in front, behind or beside you. Elk, on the other hand, are the rhinoceroses of Finland, big and cantankerous. They are completely wild, meaning they can attack when threatened. If you come across an elk, stop immediately! Do not take photos or videos. Just wait for the elk to go about its business. Porokello is a free Internet service and app (Android and iPhone) that crowdsources reindeer and elk sightings. The app runs only on Finnish phones, but the service will run natively in web browsers in early 2019. From December 1st to March 1st, all cars must have studded winter tires. If you’re driving from somewhere else, be aware that it’s not just a good idea to have studded tires–it’s the law. Above all, always drive carefully–studded tires aren’t magic. Scandia Rent is Finland’s largest rental car network, and they know snow. With offices in Rovaniemi, Kittilä and Ivalo, they’re intimately familiar with Lapland. They can put you in the right car for the right conditions, and even offer professional drivers if necessary. Their cars are heated and have studded tires for winter driving. Lapland may be an accessible and convenient chunk of the Arctic, but it’s still the Arctic. Understanding the conditions and necessities help make your production smoother and more comfortable. Rovaniemi-based Photokrafix has years of experience filming in the Arctic, and producer-DoP Juha Niemelä has some advice for anyone bringing a camera to Lapland. “Keep cameras and other equipment in boxes and in luggage when not needed. Remember to close the lids and the zippers! “When filming in the Arctic, I recommend using winter covers for the cameras when it’s cold or snowing. So the snow doesn’t melt into cameras afterwards. When it’s rainy or moist, use a rain cover. Or get an umbrella and an assistant! You can also use chemical heaters next to the batteries or beside the camera to generate more heat. “You can save battery life with a ”reverse cooling bag.” Put sealed warm water bottles in to the battery bag so that the bag becomes a warm bag. This way, the batteries will last longer. “When you stop shooting DO NOT place the camera directly on the snow. Place it in a bag or on a box. Afterwards you need to clear all metal parts of snow that they don’t start to rust. After the shoot, leave cameras on floors or tables. Don’t leave them sealed in bags; moisture won’t leave the bags.